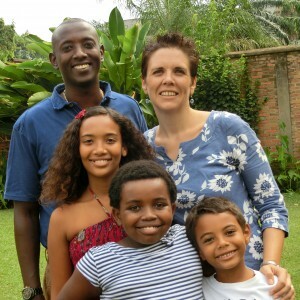 In January 2004, Restoration of Hope (RoH) was established by Midlands-born Libby and her husband, Honda Nahimana, to help the street children of Bujumbura – the capital city of Burundi. Ten years on, Libby, Honda and their family still live in Bujumbura and remain committed to seeing as many children and young people as possible taken off the streets and completely changing their environment – giving them a family, a home and an education. Children in RoH receive different levels of care depending on their situation. There are two Hope Houses where some of them live and receive everything they need, whereas others are helped within their own community. Some are given one meal a day and a place to wash themselves and their clothes, whilst others have been reunited with members of their own family but continue to receive help from RoH for education. All the children and young people supported by RoH attend mainstream school or another training facility. Hope in Burundi is a UK charity directly supporting Restoration of Hope. Hope in Burundi is run by volunteers and every penny raised by Hope in Burundi is sent directly to Restoration of Hope. RoH are involved in the lives of over 70 children and young people. One of the biggest challenges RoH face is the cost of education for these children. By the time the children join RoH they will have been living rough on the streets, some for years, and are behind in their education. State schools, although free, very often have a ratio of 1 teacher to 90 children! This makes learning very difficult, especially if there has been no prior education. Therefore, to enable them to receive the education they deserve, Honda and Libby, the founders of RoH, send the children to fee-paying schools. Without education these children are caught in the poverty trap… with education they have HOPE! How much does it cost to send a child to school? For one year’s education it costs approximately £240 per child (depending on their phase of education), so a small amount can make a big difference.